Elevated road will merge with surface road for entry and exit only; two tolls proposed of the total road length of 29km of the Northern Peripheral Road (NPR), which is crucial to decongesting the Gurgaon and New Delhi and offering hassle-free commute to long-distance travellers, the National Highways Authority of India (NHAI) plans to make 23km elevated. “In addition to the two railway overbridges (ROBs) on the entire stretch from Shiv Murti on NH-48 to a spot near the Kherki Daula Toll, 23.12km of the road will be elevated. The elevated road will merge with the surface road for entry and exit purposes only. The purpose of the elevated road is to provide hassle-free commute to distant commuters,” said Udeep Singhal, NHAI project director for the NPR. The NPR, which is more popularly known as the Dwarka Expressway, is crucial to offering high speed connectivity to commercial vehicles that form a large chunk of the traffic that is forced to cut through the Delhi city to access other states. The expressway will start from Shiv Murti near Mahipalpur in New Delhi and end on the Delhi-Gurgaon Expressway near Kherki Daula Toll. Of the 29km stretch, nearly 23km would be elevated including two railway over bridges (RoBs), one of which has been constructed in Basai. “The Delhi-Gurgaon Expressway on NH-48 is a part of the Delhi-Jaipur-Ahmedabad-Mumbai arm of Golden Quadrilateral (GQ) stretch, is presently carrying traffic of over 3 lakh passenger car units (PCUs) per day, which is much the beyond design capacity of this eight-lane highway leading to severe congestion. An alternate expressway will provide relief from this congestion,” an NHAI official close to the project said seeking anonymity. 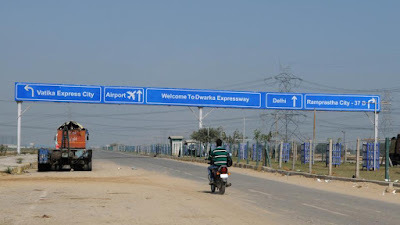 The NHAI official said that the Expressway is also proposed to provide connectivity to IGI Airport from Dwarka. In addition, it would provide direct access via a tunnel to the upcoming 90-hectares ECC in Dwarka, Sector 25. 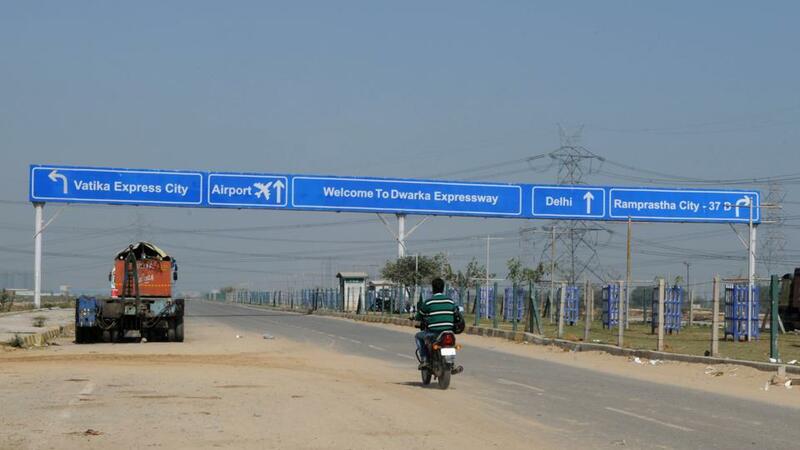 The official added that land is being acquired in Delhi to start construction of the Dwarka Expressway in April. In 2007-08, the Haryana urban development authority (Huda) had conceived the NPR as an 18-km road as part of the master plan, ‘Gurgaon Manesar Urban Complex 2031’, while carving out new Sectors 81 to 115. The road was planned from New Palam Vihar near Delhi border to near Kherki Daula Toll. The purpose of the NPR was to provide an alternate route to the Indira Gandhi International Airport and improve connectivity of Gurgaon and Delhi via Dwarka. In 2011, Huda awarded construction tender to JSR Construction Pvt Ltd and Indiabulls Construction Limited with a completion time of March 31, 2012. By 2015, the Huda completed 16.6km in Gurgaon, but the work never began in Delhi due to land acquisition issues. Remaining 1.4km stretch in Gurgaon also got stuck due to litigation. In October 2016, the Haryana government handed over the NPR to the NHAI after which the authority re-conceived it as a 29-km elevated expressway. “Hurdles are almost cleared and foundation stone for construction of the expressway is to be laid for sure. The expressway is an urgent requirement of the two cities to decongest NH-48 and improve intra-city connectivity. The perennial traffic jam Kherki Daula, Sirhaul, Rajokri flyover, Link Road, and Shivmurti, all will become smooth. The project has been delayed due to land litigation in New Palam Vihar. Now, litigation is at its end. Soon, Huda will hand over the land to NHAI,” said Union minister of state and Gurgaon MP Rao Inderjit Singh. Though the NHAI awarded the construction work to two contractors last week, many homebuyers who invested in sectors along the NPR, remain unsure. “The NHAI official has told us repeatedly that encumbrance-free land is required to start construction. So till stay (from Punjab and Haryana high court) is in force, we do not believe work would start,” said Prakhar Sahay, a homebuyer.